As far as I can make out Ernest Rowsell had little or no connection with Yeovil, nevertheless his name is recorded on the War Memorial in the Borough so I have included this brief page. Ernest Rowsell was born about 1893 in South Petherton, the son of carpenter, wheelwright and builder John Rowsell (1854-1922) and Bessie Lavinia née Lambert (1864-1925). In the 1901 census John and Bessie were living in Silver Street, South Petherton with their children; Thomas (b 1876), James (b 1887), Charles (b 1889), Henry (b 1892), 7-year old Ernest, Alice (b 1896), Florence (b 1900) and John's father, 79-year old Joseph Rowsell. John was listed as a carpenter and his son James was a carpenter's apprentice while the eldest son Thomas was a blacksmith. In the 1911 census John and Bessie were living in South Street, South Petherton with Charles, Ernest, Florence and Reginald (b 1904) By this time 18-year old Ernest was working as a blacksmith, presumably with his brother Thomas. Ernest enlisted in the 2nd/1st West Somerset Yeomanry and from his Service Number 1153 it is known that he enlisted in September 1914, his trade was, naturally enough, a farrier. By 1914 the West Somerset Yeomanry were headquartered at Taunton, with its four squadrons disposed as follows: A Squadron at Wellington, B Squadron at Taunton, C Squadron at Bridgwater and D Squadron at Yeovil. The regiment formed part of the 2nd South Western Mounted Brigade which was administered from Exeter. The two reserve units, the 2nd/1st and 3rd/1st, were formed at the outbreak of the Great War. The 2nd/1st West Somerset Yeomanry was formed at Taunton in 1914. In January 1915 it joined 2nd/2nd South Western Mounted Brigade at Woodbury. The Western Gazette takes up the story in its 19 February 1915 edition, "Much to the regret of all who knew him, the sad tidings that Farrier Ernest Rowsell, attached to the West Somerset Yeomanry, who was serving his King and country at Minehead, was stricken down with illness necessitating his removal to the Military Hospital, came as a very sad surprise. Making no satisfactory progress he obtained leave to return to his home at South Petherton. Here, despite every attention, he developed consumption of the most rapid character and passed away peacefully on Tuesday of last week at the early age of 21 years. The funeral took place on the following Saturday amid every sign of respect. Some of his comrades who had been granted leave journeyed from Minehead, and, together with other Territorials, walked in procession at the head of the cortege. Next came the parish bier containing the coffin on which were placed many beautiful floral tributes. The following were the chief mourners:- Mr John Rowsell (father); Messrs. Joseph, Tom, George, Fred, James, Harry and Reginald Rowsell (brothers) and J Murphy (brother in law). Leaving the deceased’s residence, the mournful cortege wended its way to the Parish Church, where the first part of the Burial Service was conducted. At the termination, the solemn procession proceeded to the cemetery, where the Committal portion of the service was performed. The Vicar (Rev. J. Holding) officiated." 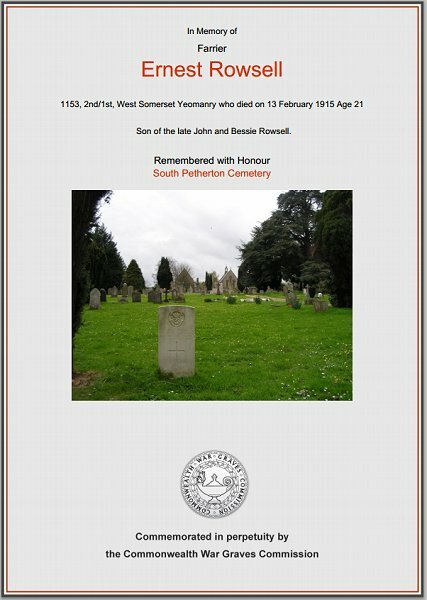 Ernest, aged just 21 when he died on 13 February 1915, is buried in South Petherton cemetery, Grave MN.17, and his name is recorded on the War Memorial in the Borough. The Commonwealth War Graves Commission certificate in memory of Ernest Rowsell although, of course, John and Bessie weren't 'late' at the time of their son's death.